I love East Asian cuisine. And considering it’s the most populated region in the world and they have such a rich and vast diversity in their food culture, I’m very glad I love it. If you asked me which was my favourite though, that would be a tough one to answer. There’s so much that’s amazing and different about their dishes and foods that it’s hard to pick one over the other. However if I’m a bit under the weather and I crave something comforting, I know what I want. It’s one of two simple choices. Thai or Vietnamese. 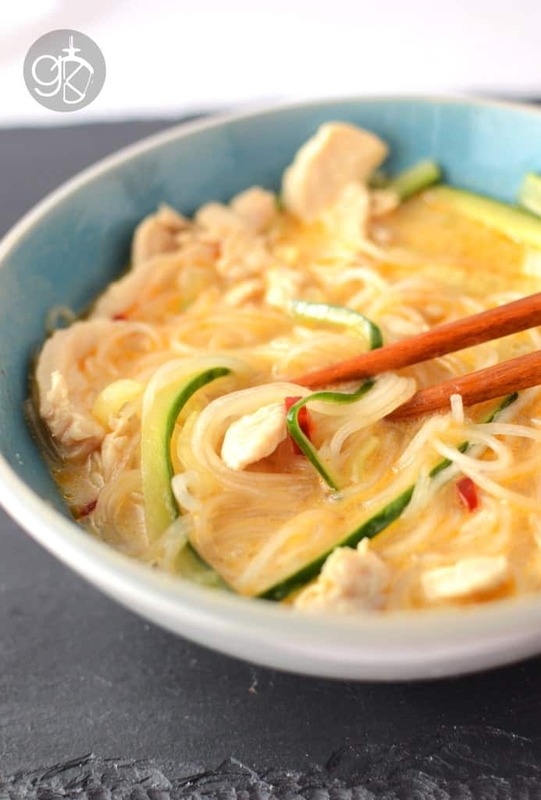 This Lemongrass Noodle soup with Cucumber & Chicken was a result of one of those times when I was yearning for some Thai or Vietnamese food, but couldn’t get to a restaurant. It has evolved quite a bit since the first time I made it, but I think I love it the best in its current form. Which is why I’m going to share it with you all today! I love lemongrass and there’s most certainly more than a hint of it in this amazing dish. It’s also a flavour that is common to both Thai and Vietnamese cuisines, so I’m not entirely sure which category of cuisine I would file this under. Maybe I’ll just make a new one and call it “absolutely amazing noodle soup recipes”. Because this dish is all that and more. There are many words I can use to describe this soup. It’s fresh, warming, comforting, light (with a little bit of heat), and packed with incredible flavours. Lemongrass by itself has beautiful earthy, citrussy notes, you probably don’t need to add much else to elevate the flavours in this dish. MY absolute favourite part of this soup though is the cucumber. It adds a really nice crunch and coolness that acts as a fantastic contrast to this warm and spicy soup. The coconut milk adds a wonderful creaminess without making the soup heavy and mellows out the heat from the spices a little (which you can of course adjust to your preference). Plus the coconut complements the lemongrass flavour really well too. You may notice in the recipe that I “fry” some chilli flakes in a little oil before adding them to the soup. I have always loved a little bit of chilli (oil and flakes) floating on top of soups like this because it adds a fantastic flavour as you sip (or slurp) the soup. Plus I really like how pretty those chilli flakes look, swimming in the soup like that. I made this soup with chicken stock and added chicken (mainly for the benefit of my husband), but this can easily be omitted or replaced with something like vegetable stock and tofu as well. And please use a GOOD chicken stock. Nothing would make me happier than making this with homemade chicken stock, but let’s be honest, not all of us have home made chicken stock at home all the time. So store bought is more than fine. However make sure it is a good one and it’s your favourite (chicken or vegetable stock). 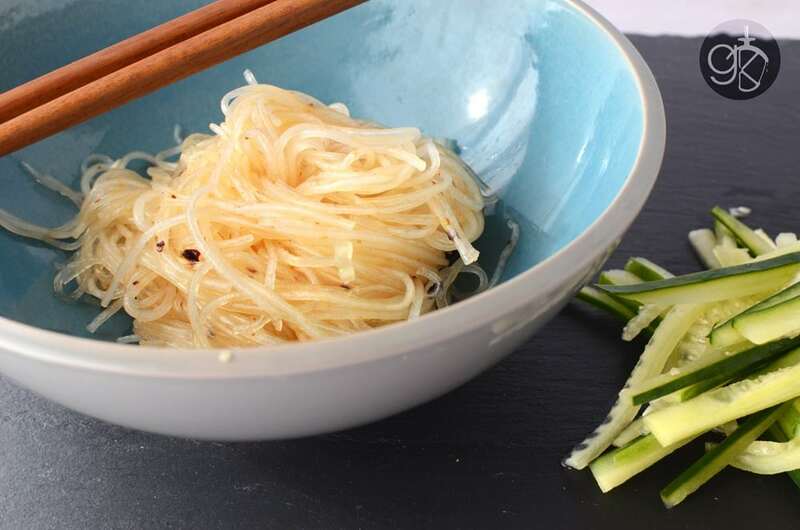 I have always used mung noodles or glass noodles for this soup because it’s my favourite. I love how they become translucent as they cook. However you could easily substitute it with a different kind of noodle. And if you don’t want noodles, you can prepare just the soup with maybe double the amount of cucumber instead (I’ve done that too, and it’s still great with a lovely texture). It’s best if you add the cucumbers in last. Or you can serve the cucumbers separately if you want. Or, serve the soup immediately after ladling the hot soup over the cucumber and noodles. I just personally like the cool crunch of the cucumber with the soup and the longer the cucumber sits in there, it will warm up with the soup. In a saucepan, pour the chicken stock and add to it the following - the lemongrass, 1 fresh chilli or 1-2 dried chilli, ginger, sliced onions, sugar, soy-sauce, and coconut milk. Bring to a boil on medium heat and then lower the heat and let it simmer for about 40 min to 1 hour. Add the lime juice and lime zest as well. In the meantime start preparing the noodles. Place the noodles in a bowl and add the salt. Pour boiling water over the noodles to soak and keep it covered for 10 minutes (a little less time than the manufacturer's instructions). Drain the noodles and drizzle in some oil to coat the noodles. This is to prevent the noodles from sticking together and turning mushy. You can use unflavoured oil or chilli oil if you prefer. Set aside until you are ready to serve. When the soup has simmered for at least 40 minutes, strain the soup to remove the onion, ginger, lemon grass and chilli. Discard this and keep the soup aside. In the same saucepan, heat 2 tbsp of oil and add the chilli flakes. When the chilli flakes start to sizzle and turn dark, pour the strained soup back in. Thinly slice a de-seeded red chilli (dry or fresh), and add it to the soup (de-seed it if you prefer less heat). Bring the soup back to a simmer, and add salt to taste. Once the soup is simmering, add the thinly sliced chicken. Let the chicken cook in the simmering soup (which should take about 10 minutes). 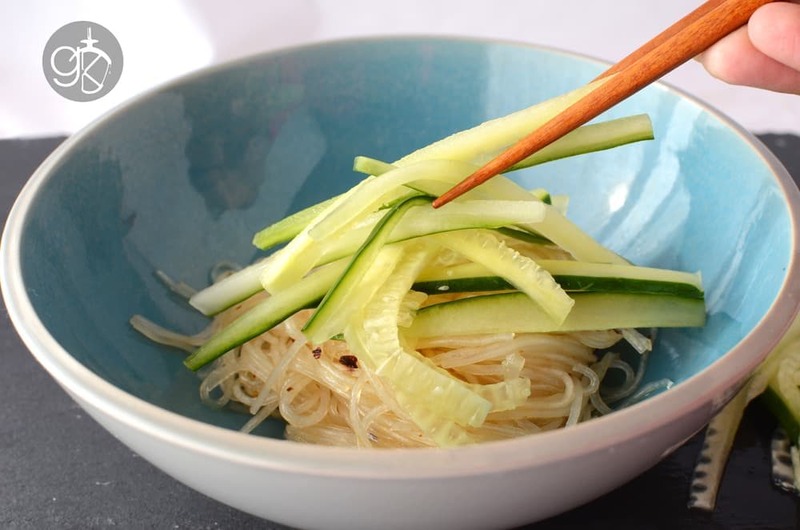 Divide the soaked noodles between two bowls and add the julienned cucumber. 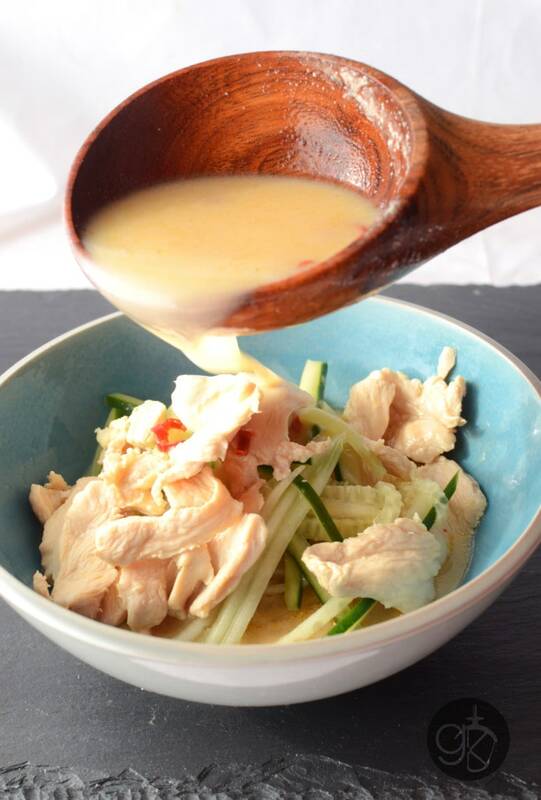 Ladle the soup over the noodles and cucumber and serve immediately. When I say this serves 2-3, I mean that it should serve 2 people very generously, 3 individuals who might be light eaters, but only 1 of my husband! He absolutely loves this soup and would finish all of it in one go, unless I stop him! Like I said earlier this is a very warming, satisfying, slightly spicy soup and it’s perfect for this time of the year. And I love how the chicken is perfectly cooked (isn’t dry at all) and absorbs the flavours of the soup. Coconut and lemongrass is a classic combination and it works like a charm here too. I hope you can give this one a go and let me know what you think. There’s nothing like a warm, spicy, flavour-packed soup to wake up your taste buds, especially in the winter! I made tonight! We all love it!! Will make it again….and again. Just double checking on the ingredient list before making this as the chicken stock says 2q/1 liter, but 1 quart is basically 1 liter. Do you mean 1 quart? Thank you for pointing that out! Yes 1 qt is the right amount! I have fixed it in the recipe now. Again, thank you for letting me know. Great, thanks for the reply and I definitely will! Looking forward to getting some delicious use out of the lemongrass we’ve been growing over the summer! This turned out fantastic! We both really enjoyed it and I look forward to making it more often. Thanks again! I’m so glad that you joined us for this week’s Bloggers Brags Pinterest Party! I’ve pinned your post to the BBPP Pinterest Board. See you next week! Dini, this soup looks wonderful and I know I would love it. I’ve been meaning to look for a recipe like this, and here it is! I am so excited! Last night I went out for Thai food with some girl friends…it was probably nothing like what you can make, or get, but I really enjoyed it. At any rate, I plan to try your soup! Pinning it right now. Thank you Michelle! 🙂 Im so glad you loved Thai food too! One day I will learn all Authentic Thai Dishes! Where I live now, there isn’t a good Thai restaurant as far as I know 🙁 I hope you make the soup! It’s one of our favourites! Oh my goodness! I just want to plant my head inside that soup bowl! I love all the sweet, sour and savory flavors inside that wonderful combinations. 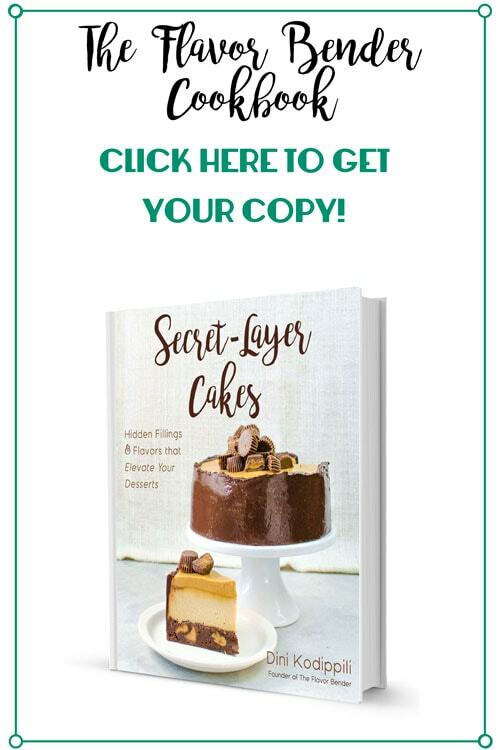 Thanks for adding it to our Sunday Recipe Wrap Up Link Party! Wow. Just wow. This soup is stunning. It looks and sounds so amazing. I love the contrasting flavors with a bit of heat and then a cool refreshing touch from the cucumber. Wonderfully done. Thank you so much Meghan! 🙂 This is a favourite in my family. Always leaves us feeling full and feeling good! Wow! This looks so good. I have never cooked with lemongrass or glass noodles, but your detailed directions have inspired me to try. I’m glad I found this recipe and your beautiful blog at the Sunday Recipe Wrap-up! Im a subscriber now! I am book marking this delicious recipe. 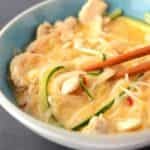 I love lemongrass and this one delectable noodle soup! That looks fantastic, Dini! I really love the sound of it. Will try! This looks too good to be true! Can you please come over and whip up a batch for me? Haha! I’ve got some Thai lemongrass sausage that I think would be wonderful in this as well. Thanks for sharing! hahaha!! thank you Justine! I would love to make a batch for you! 😀 Thai Lemongrass sausage would be absolutely perfect for this… I wish I had some! I love that you don’t cook the cucumbers so that they retain a bit of that cool crunchiness. I’m looking forward to trying this! Thank you Christine! I love the crunchiness of the cucumber especially with the soft noodles along with it 🙂 Please let me know what you think if you do try it! I am drooling, Giramuk!! This is my kind of soup! Lemongrass is just the best, isn’t it? I agree Julianna! 🙂 Thank you so much! This soup looks absolutely delicious Dini, I think the cucumber addition would be my favourite part too! Gorgeous photos as always! This soup looks delicious. I have some lemongrass growing in my kitchen, and should use some in case it doesn’t survive to be transplanted in spring. Thanks for a great way to use it. This looks delicious, all flavors I really like, so will have to give it a try! What a beautiful colorful soup Dini. It looks so fresh. I like your addition of the cucumber for texture. Thank you Julie! 🙂 The cucumber is definitely one of my favourite things in the soup! I love that trick of toasting the chili flakes in oil – I have a few soup recipe ideas that were missing that little something and I couldn’t figure it out. I think that may be the trick. And I love love love your photos – the chopsticks were a great idea! Great mix of textures and flavors! Love the way the tartness of the lemongrass will combine with the richness of coconut and the heat of the peppers. The flavor combination sounds amazing! Can’t wait to try. Thank you Judi 🙂 I love lemongrass too! That does look really tasty! I need to pick up some lemongrass and try it! Thanks for sharing it with us at Foodie Fridays…spreading some foodie love around for you! Delicious! I think my kids would totally love this too! Thank you Jen! This is one of my favourite soups for sure 🙂 I hope your kids like it too! Dini…this looks phenom!!! Right up my husbands alley!!! Pinning! Thank you Mila! 🙂 I hope your huband likes it!